Dunes and Desert Hills, Evening. © Copyright 2019 G Dan Mitchell – all rights reserved. 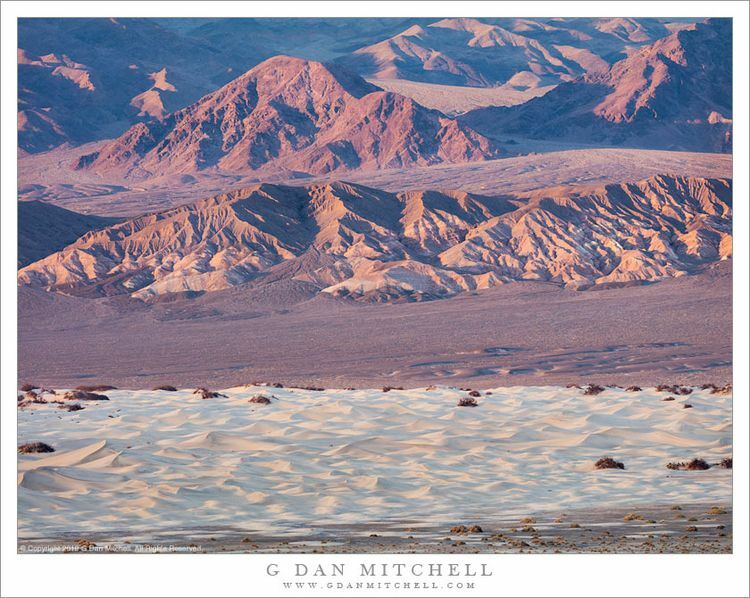 Evening light on dunes and eroded desert hills in Death Valley National Park. This view is probably at least somewhat familiar to most who have visited Death Valley, though some may have overlooked it while paying more attention to a more famous nearby feature. The scene incorporates several elements that are “classic” Death Valley: the low dunes in the foreground, the large expanse of low-angle on the other side of the dunes, and the denuded desert hills and mountains ascending beyond that. I found myself in the particular location from which I made the photograph as the result of some last-minute scrambling to deal with problematic light. Originally I was planning to photograph in sand dunes in the late-day and evening light. However, when I arrived I found that a large cloud had “turned out the lights” on that scene, and I wasn’t sure if it would move in time. So I tried a different strategy — rather than focus on one small subject I found a place from which I could see the vast expanse of the entire upper valley, and then I waited for various areas to be spotlighted by beams of light breaking through the clouds. A brief moment of light slanted across the low dunes and onto the hills across the valley just before the sun dropped behind mountains to my west.